Captured one morning. It’s the usual situation that you can see every morning in the park near our home. Bananas are displayed on the grass. 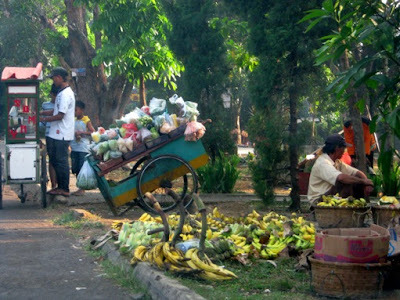 The food vendors and vegetable vendors are waiting for the buyers there. I agree with Luna. Produce sold in the side streets are usually cheaper. Have a fabulous week. Wow, look at those bananas. Visiting from Mellow Yellow Monday. Come and see it when you can. Thanks for sharing this photo. Nice capture!